Dominic Sposeto graduated from Santa Clara University Law School. He was chief counsel of the Legal Aid and Public Defender Office of Santa Clara County, California, dabbled in the entertainment industry and later became partner in the law firm Madsen, Sposeto and Parker and went on to work on thousands of criminal cases. He lives with his wife in Santa Rosa, California. To see Dom's new dog, click here. They say that "justice is blind." But what if your defense attorney is blind as well? Such was the case for the thousands of clients of Sonoma resident Dominic Sposeto, a nationally-recognized lawyer and now author. 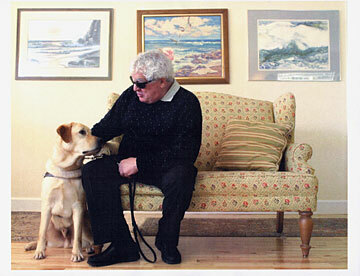 Many of the cases Sposeto worked on are detailed in his recently published memoir, "La Famiglia and their Blind Advocate," in which Sposeto also recounts a family history spotted with mafia affiliations. Sposeto's conversation is sprawling and brims with anecdotes and asides. Whereas some spin yarns, Sposeto weaves whole verbal tapestries from such seemingly disparate threads as dock workers, Sicilian fisherman, jazz singers, family lore, a nightclub he owned and the specter of the mafia always looming. An avid swimmer as a young man (the enterprising Sposeto directed aquatics programs throughout the East Bay in his late teens), a diving injury agitated a congenital retinal condition that would leave him blind by the age of 20. Sposeto credits his mother Mary (referred to throughout the book as "Mama") with supporting him through the trying transition into permanent darkness. Read more... or email Dom.